RF, IF and baseband amplifiers; RF, IF, and baseband filters; fixed and tunable local oscillators, single- and double-balanced mixers, attenuators, envelope detectors and phase detectors, directional couplers, power combiners and dividers, et cetera, are all component types used for receiver systems regardless of whether vacuum tubes or transistors comprise the active parts. 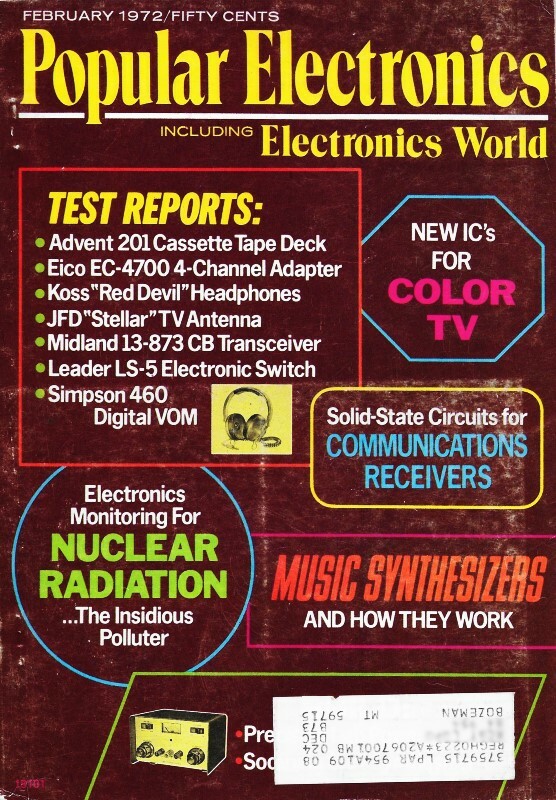 In 1972 when this article appeared in Popular Electronics magazine, people were beginning to get comfortable with the idea of transistorized products replacing the familiar tube. Instant-on televisions and radios were a welcome innovation made possible by transistors that needed no warm-up period. The introduction of integrated circuits (IC's) for some of the low frequency functions like IF (intermediate frequency) and baseband (BB) led to smaller size, lower power, more lightweight, and less expensive gear - usually with greater capability and improved reliability. Fig. 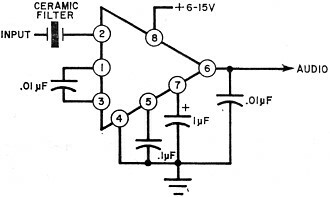 1 - This is a simple single-conversion superheterodyne as used in most receivers. The i-f is 455 kHz, which is somewhat standard, but other frequencies could be used. Fig. 2 - Double conversion superhet uses a crystal-controlled first local oscillator and a variable second for actual tuning. Image rejection is better than in single-conversion type (above). Fig. 3 - Here, the dual-gate MOSFET r-f stage has its gain controlled by a negative voltage which shown is applied to gate 2. Fig. 4 - This mixer also uses a dual-gate MOSFET, with the local oscillator signal applied to gate 2 of the transistor; r-f on gate 1. Fig. 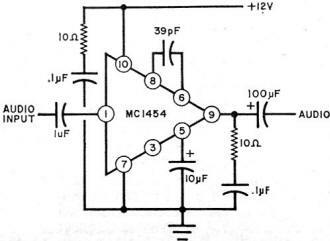 5 - This circuit shows how a junction FET can be used as mixer. There is less isolation than when the dual-gate MOSFET is employed. Fig. 6 - This tunable oscillator is locked to harmonic of crystal frequency and kept on frequency by the action of the phase-locked loop. Fig. 7 - Typical crystal-controlled oscillator using a junction FET. The tuned circuit in the drain is set to the crystal frequency. 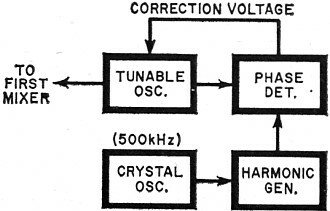 For a different frequency, both crystal and the tuned circuit components must be changed. Fig. 8 - This tunable circuit is used as second local oscillator with a buffer stage to provide isolation from the mixer circuit. Fig. 9 - This IC i-f stage provides 0.8 volt output from an input as low as 50 microvolts. The circuit also has agc range of 60 decibels. Fig. 10 - The integrated circuit used in this i-f strip costs only $1.50 and provides 70 dB gain at 455 kHz. Fig. 11 - This simple product detector for CW and SSB applications uses a back-to-back dual diode arrangement. Fig. 12 - There are many available integrated circuit devices that can be used in the audio amplifier stage. Some will provide up to 5 watts output. Receivers, like almost every other kind of electronic equipment, have grown increasingly complex - primarily because people expect so much more of them in terms of performance and versatility. Almost all of the bands, commercial and amateur, are getting so congested that selectivity poses a real problem in the design of a good high-frequency receiver. Single sideband, with all of its advantages, has brought with it the need for stability far greater than that required for conventional AM. And, to top it all off, everyone wants receivers that are smaller and more compact. The appearance of the transistor provided the answers to some of these problems. Space and weight could be trimmed significantly, while heat, long one of the big enemies of electronic equipment, could be almost eliminated. However, transistors had problems of their own - leaving a lot to be desired as far as stability, overload, and circuit design were concerned. Then along came integrated circuits and field effect transistors. The IC brought more space reduction and, in some cases, simplification of circuits. The FET has solved many of the overload problems connected with bipolar transistors. The FET high input impedance has almost eliminated loading of tuned circuits, resulting in higher Q's and improved selectivity; and the low noise of FET's has improved sensitivity. So it is now possible to design and build a solid-state receiver that is equal to, or even better than, its vacuum tube counterpart. Most electronic experimenters choose to buy factory built receivers because they feel the task of constructing one is beyond their capabilities. This is not necessarily the case. They build many other electronics projects that are just as complicated. Perhaps a better understanding of just how a solid-state receiver is designed and how it works would cause many to try constructing one for themselves. The Basic Superheterodyne. A block diagram of the basic superhet system is shown in Fig. 1 - applicable to simple BCB units, FM receivers, CB rigs, radio control, etc. Assume that the input circuit of the mixer is tuned to 5.000 MHz. A local oscillator built into the receiver is tuned to 5.455 MHz and is coupled to the mixer. When a nonlinear device has two such signals fed into it, there are four signals at the output: 5.000, 5.455, 10.455 and 0.455 MHz. By following the mixer with a selective tuned circuit and amplification (the i-f amplifier) at the difference frequency (455 kHz) considerable improvement in selectivity can be achieved as opposed to the mere amplification of the 5.000-MHz signal alone. Why? Because the higher the frequency of a tuned circuit, the less selective it becomes. For this same reason, the sum frequency (10.455 MHz) was passed over. Double Conversion. In considering the layout in Fig. 1, a logical question arises: Why not move the local oscillator frequency nearer to that of the received signal? This would lower the frequency of the i-f amplifier and provide even more improvement in selectivity. This is true; but, as the i-f frequency is lowered, problems of another nature arise. The mixer is not selective enough to attenuate all signals other than 5.000 MHz - especially those close to 5.000 MHz. If, for example, a strong signal at 5.910 MHz appears at the input, it too will mix with the local oscillator frequency and will also produce a difference frequency of 455 kHz. This will be amplified in the i-f amplifier, producing what is called an image of the other 455 kHz. Images can appear anywhere in the tuning range of the receiver. Thus, it can be seen that moving the local oscillator frequency closer to the received signal brings the images closer and makes it more difficult for the tuned circuits to attenuate them. Adding more tuned circuits between the antenna and the input to the mixer will help, and this is one reason for adding an r-f amplifier. However, as receivers are called upon to get signals of higher and higher frequencies, the number of tuned circuits needed to solve the image problem becomes prohibitive. One solution is to use double conversion as shown in Fig. 2. Now, with the same 5.000-MHz input, the first local oscillator is tuned to 11.000 MHz; and the output of the first mixer is 6.000 MHz, the difference frequency. The image frequency is now 17.000 MHz, which is far enough away from 5.000 MHz to be attenuated. To get a lower i-f frequency for better selectivity, the second mixer is fed by a local oscillator at 6.100 MHz, and the difference frequency of 100 kHz is amplified and detected. In addition to solving the image problem, double conversion can be a real asset in improving stability. An oscillator is always a source of frequency drift in a receiver, and the higher the frequency, the greater the problem. In some double conversion receivers, the first local oscillator is crystal-controlled for stability, and the second, working at a much lower frequency, takes care of the tuning. Over­all stability is thus considerably improved. However, double conversion receivers are not without their drawbacks. Every time an oscillator is added, chances of spurious responses increase considerably, so quite a few single conversion receivers are still to be found. But, instead of a low i-f frequency, they use a frequency as high as 9.000 MHz to reduce the image problem. The development of excellent crystal filters for this frequency range has helped to solve the problem of selectivity for these single conversion units. RF Amplifier. 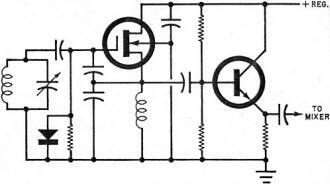 An r-f amplifier is included in high-frequency receivers for two main reasons: to increase the level of the antenna signal to a point where it will override the noise generated in the mixer, and to offer discrimination to spurious signals. Too much amplification can create problems with cross-modulation and blocking, which can occur when one stage of the receiver (the r-f or mixer) is overloaded. The circuit of an r-f amplifier using a dual-gate FET is shown in Fig. 3. The FET works well as an r-f amplifier because of its excellent "square-law" behaviour, which means that a frequency applied to its input appears at the output along with the frequency's second harmonic - and no other harmonic. If the circuit is tuned (as in an r-f amplifier), the second harmonic is of no importance since it will be eliminated. The square-law behaviour of a FET is much better than that of a bipolar because the latter has characteristics similar to a diode, resulting in more harmonics. In the circuit shown in Fig. 3, the signal is applied to one gate of the dual-gate MOSFET, while automatic gain control is applied to gate 2. This use of feedback to control the gain on the second gate is one of the big advantages of the dual-gate FET. As mentioned previously, the FET also has a high input impedance so that it does not load the tuned circuit and it makes possible a very high Q to prevent spurious signals. Mixer. As its name implies, the mixer stage takes two signals, mixes them, and provides outputs which are the sum and difference of the two. By selecting the proper output, a high frequency can be converted to a much lower one. Any nonlinear device can be used as a mixer: diodes, bipolar transistors, or FET's. Usually the diode is not used at lower frequencies because there is a signal loss in conversion, and the characteristics of a bipolar limit its usefulness when handling strong signals. Here again, the dual-gate MOSFET is preferred - even over the junction FET or single insulated gate FET. 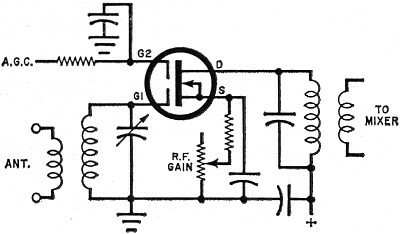 The second gate is used for the local oscillator input (see Fig. 4). With the r-f input on gate 1, the signal and the oscillator are well isolated. This eliminates a problem called "pulling," which means that the tuning of the mixer causes a shift in the frequency of the oscillator. 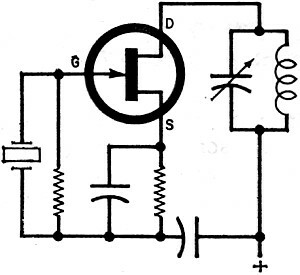 A mixer using a junction type FET is shown in Fig. 5. Like the circuit in Fig. 4 it provides signal gain while converting the input to the i-f frequency (conversion gain), but the isolation of the oscillator frequency is not as good as provided by the circuit in Fig. 4. Local Oscillator. 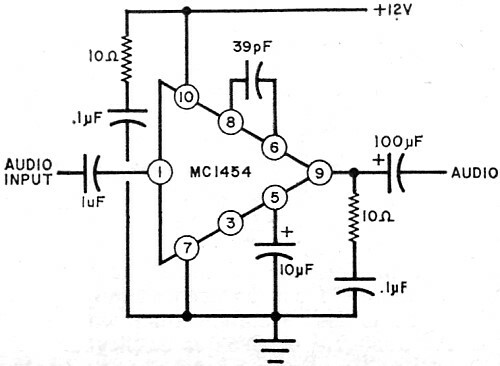 In the simple super-heterodyne, the tuning range of the local oscillator must maintain the difference between its own frequency and that of the input so that the i-f frequency is always the prescribed amount - in the case of the example used here, either 455 kHz above or below the signal. This frequency difference must be maintained throughout the frequency range of the receiver if the i-f amplifier is to pass and amplify (called "tracking") the mixer output. Many modern double conversion receivers use a crystal-controlled first local oscillator to improve stability at high frequencies. The second local oscillator, operating at a much lower frequency is tunable. In addition to providing stability, this method assures the same tuning range on all bands and makes calibration easier because the oscillator's tuning range is the same on all bands. Several types of communications receivers used by amateurs utilize this principle, and often as many as a dozen crystals are used in the first local oscillator. If more expanded coverage is desired, the designer must include more crystals and a more complex switching arrangement. Some of the more expensive and complicated receivers, designed to receive signals between 500 kHz and 30 MHz, have a first oscillator whose frequency can be shifted, either by conventional tuning, or by band switching inductance and capacitance. Such an oscillator normally would be too unstable, but in this case it is phase-locked to harmonics of a very stable crystal oscillator. Though somewhat more complex, this arrangement offers excellent stability, a reduction in the number of crystals needed (usually only one or two), a much wider range of frequencies, and simplified switching. A block diagram of a phase-locked oscillator is shown in Fig. 6. A precision 500-kHz crystal oscillator drives a harmonic generator, which provides good, strong harmonics to frequencies well above 30 MHz. These harmonics, appearing at every 500 kHz, are fed to a phase detector which also receives the output of the tunable oscillator. As long as the tunable oscillator is at an exact multiple of 500 kHz, the output of the phase detector is zero. However, if the oscillator drifts, the output voltage of the detector, which is coupled to a variable capacitance diode connected across the oscillator tuning coil, brings the oscillator frequency back to the correct value. With proper design, a phase-locked oscillator has extremely good stability - even better than some crystal oscillators operating at higher frequencies. For those interested in a simpler approach, Fig. 7 is a crystal-controlled oscillator using a junction FET. The circuit in the drain is tuned to the crystal frequency. For multi-band operation it is necessary to switch crystals and tuned circuits. As mentioned previously, many receivers have a tunable second local oscillator that determines the frequency stability of the receiver. In the circuit shown in Fig. 8, a buffer stage is included to provide more isolation and minimize "pulling" of the oscillator. The oscillator uses a single-gate MOSFET, while the buffer is a conventional bipolar transistor. I-F Amplifier. No mention has been made so far about the use of integrated circuits. Why? Simply because there does not seem to be any IC that equals the performance (in the circuits discussed so far) of the devices suggested. With the i-f amplifier however, it's a different story. There are several IC's available that certainly do an excellent job here. What do we expect the i-f amplifier to do? Amplify, of course; but it is here that we seek to achieve much of the receiver's selectivity. It is possible to provide amplification very simply with an IC; but selectivity must be added, usually in the form of a crystal or mechanical filter. Recently, also, ceramic filters have been used and they offer some advantages, especially in size and cost. 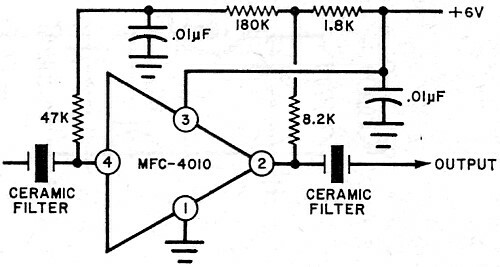 A ceramic filter approximately 14" square and 3/4" long can be bought for less than $15 and it can be combined with an IC to make a very good i-f stage. 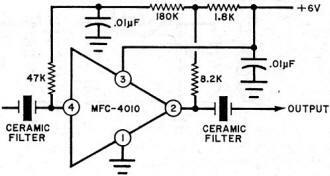 Generally speaking, most crystal filters used today are of the higher frequency types (up to about 9 MHz) and the mechanical filters are for lower frequencies (to about 500 kHz). Space does not permit a description of all of the IC's that are available for an i-f amplifier. One typical example, however, is shown schematically in Fig. 9. Designed for AM use only, it provides 0.8 volts, peak-to-peak with inputs as low as 50 microvolts at pin 2. It has an extremely good agc network as well as an AM detector. The agc range (referred to pin 2) from 50 microvolts to 50 millivolts is 60 dB. The IC is in a TO-5, 8-pin case and with four capacitors and some means of achieving selectivity, it makes a good AM i-f strip. The IC is an LM-372. A schematic of an i-f strip built around a new, low-cost IC recently announced by Motorola is shown in Fig. 10. It is extremely small, but provides a gain of up to 70 dB at 455 kHz. The IC is about $1.50. Product Detector and BFO. Most modern receivers use one form or another of a product detector for SSB and CW reception. To understand why a product detector is desirable, we must review some basic facts about these two modes of transmission. First, with both SSB and CW, something must be added at the receiving end to produce audible signals. With CW we have a carrier, but no audio modulation. So an oscillator is built into the receiver with a frequency very near the i-f. When the two are mixed (beating against each other) a signal in the audio range is produced. It is the same principle as in the mixer stage except that the output is an audio beat. Usually the beat oscillator is variable in frequency so that the pitch can be varied to suit the operator. In receiving SSB signals, we must remember that the carrier was suppressed at the transmitter so that the receiver must supply the carrier. This is done by the beat oscillator operating with the sideband to produce audio. Just as with CW, the beat oscillator must be positioned properly as far as frequency is concerned for best results. Why a product detector? Because the regular diode detector most often used with AM will introduce severe distortion unless a proper balance is maintained between the signal and the beat oscillator. This is difficult to do. In most receivers lacking a product detector, it is necessary to reduce the signal input with the r-f gain control. With a product detector, which is really a mixer-type demodulator, the requirements as to the ratio between the received signal and the beat oscillator is much less critical so the audio is much "cleaner." 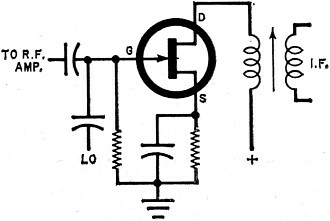 One very simple product detector circuit, with back-to-back diodes, is shown in Fig. 11. The beat oscillator must be stable and also. must have sufficient output. Because of the need for exceptionally good stability in the BFO, many manufacturers use crystal-controlled oscillators. Usually two crystals are provided so that the frequency will be correct for either upper or lower sideband when receiving SSB. Audio Amplifier. 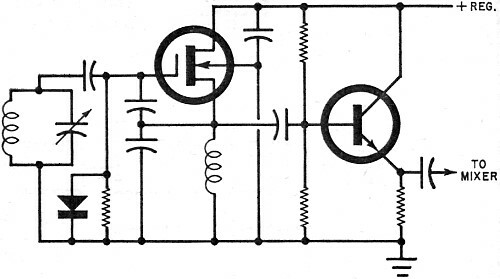 The use of an IC in the audio portion of a solid-state receiver is the only logical approach. There are many available to do the job. One possibility is the circuit shown in Fig. 12. It uses a minimum of parts and operates with a 12-volt input. An RCA unit uses a maximum of 9 volts. The General Electric PA-234 provides 1 watt; the PA-237, 2 watts. Other Considerations. There are many other factors involved in the design and construction of a solid-state receiver. Not all of them can be covered here, but most of them have to do with mechanical details. For instance, it is almost imperative to use printed circuit techniques, and the construction should be good and solid. The power supply must be of the well-regulated, solid-state type.